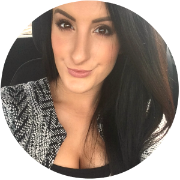 As my obsession with skincare has grown over the years, my cleansing routine has also evolved considerably. During my teens, I simply used my fingers to work cleansers into my skin and to remove them. Then, I introduced muslin clothes into my regime, thanks to the recommendation of Liz Earle and her famed Cleanse & Polish (spoiler - it didn't work for me). After a brief dalliance with a certain sonic cleansing brush, which left my skin in a horrific state of dry rashy patches and painful breakouts, I finally settled on the humble flannel being my perfect cleansing companion. Then, recently, I sampled the new range of konjac sponges from the Konjac Sponge Co and they've become my new favourite tool of the trade. If you haven't heard of konjac sponges before, they're made of 100% natural konjac plant fibers, which are rich in moisture, minerals and anti-oxidants. When blended with volcanic water, they create the perfect facial puff to cleanse and gently exfoliate the skin with. Free from chemicals, colorings, additives and irritants, the sponges are non-toxic and certified cruelty-free and vegan-friendly. They're also 100% biodegradable and fully sustainable. 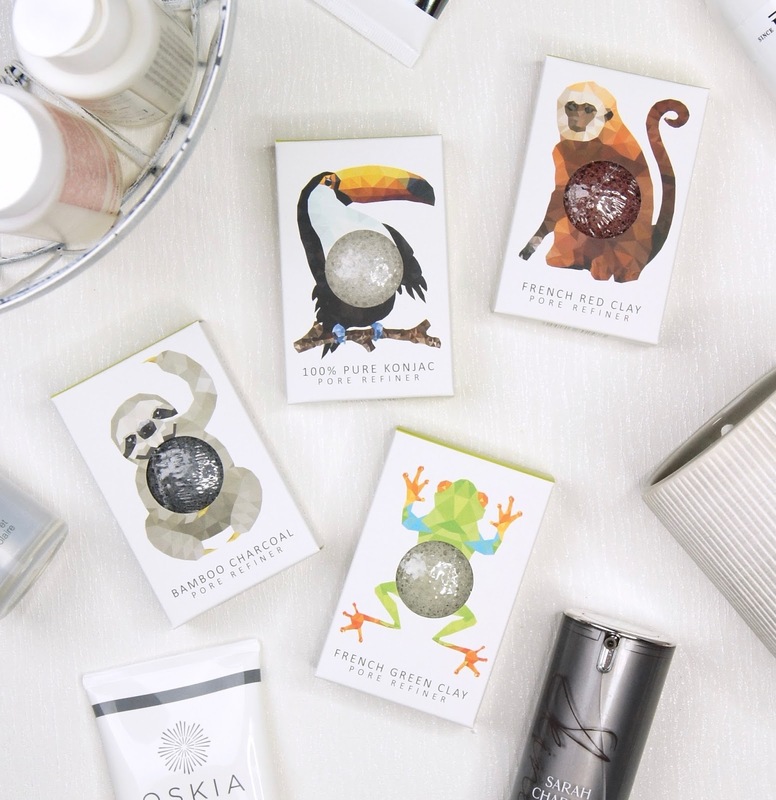 The Konjac Sponge Co's limited-edition Rainforest Collection* includes four mini pore refiner sponges, each of which has an adorable animal design and works to treat a different skin concern. The packaging is super cute and the mini size makes them the perfect companion when travelling. The sponges come in a complete set for £25, or can be purchased separately for £6.99 each. The Toucan is simply made of 100% Pure Konjac, which is known for it's hydrating and purifying properties. As it doesn't contain any additional ingredients to target blemish-prone, oily or dry skin, then this particular sponge would suit normal and sensitive skin-types best. The Tree Frog contains mineral-rich and highly-absorbent French Green Clay, one of nature's strongest antiseptics. This is the classic clay used to treat combination oily skin, as it helps to balance oil production and restore the complexion. Whilst tightening pores and toning, it naturally draws out impurities to reveal a clearer, fresher complexion. The Monkey is infused with French Red Clay, which is high in iron-oxide and is well known for boosting circulation and creating a radiant glow. It works to get rid of dead skin cells and accelerates regeneration to brighten dull skin. This sponge is great for treating uneven skin-tone and broken capillaries and, as it helps to reduce the appearance of lines and wrinkles, it would be a great choice for dry or more mature skin. The Sloth contains Bamboo Charcoal, which is anti-bacterial and anti-fungal. Helping to detoxify the skin, by decongesting clogged pores and absorbing toxins, using this sponge works just like a charcoal face mask, but is a much less messy and time-consuming option. 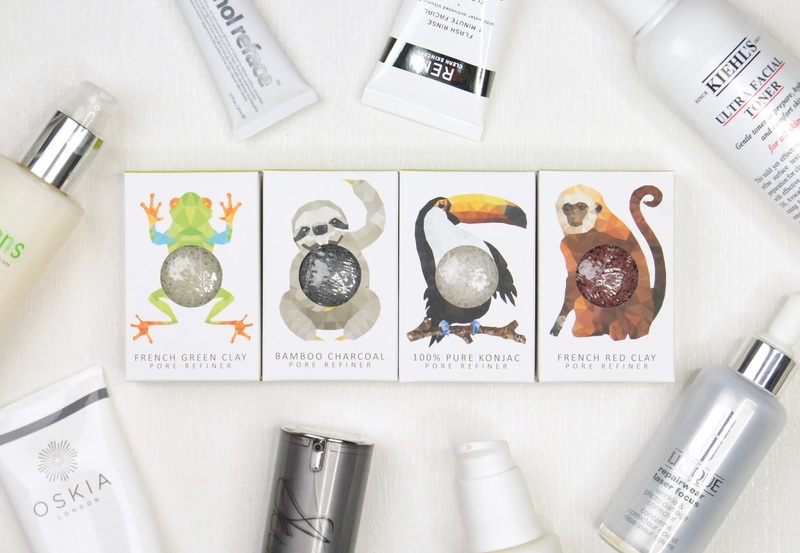 The Sloth would be best suited for those with acne-prone skin, or for anyone who struggles to get rid of blackheads. When dry, the sponges are tiny and hard to the touch. Once saturated with water, they swell and plump up to a much smoother, squishy texture. Konjac sponges were originally created for bathing babies, so that's an indicator of just how soft they are. Ensuring the puffs are thoroughly soaked, they feel extremely gentle on the skin, even around the delicate eye area. They definitely exfoliate the skin, but aren't anywhere near harsh enough to cause redness or irritation. Flannels drag the skin as you use them, whereas these sponges buff over it without pulling, which is much better for preventing aging. After using the konjac sponges, my skin is left feeling really polished, clean and firm. As long as you look after the sponges (by gently pressing the water out of them, to avoid breaking up the konjac fibres) and allow them to fully dry out between uses, they should last for 3-4 months. If they start to disintegrate, it's time to replace them. Another bonus with konjac sponges, is that you don't have to use a cleanser with them. You can, but they work to purify the skin even on their own. Whilst I've been using them alone in the mornings, I prefer to use them alongside a cleanser in the evenings. I'll remove my makeup first, before following up with my chosen konjac sponge and a cleanser. I'll massage it in with my fingers, then work the sponge around my face to gently exfoliate, before using it to remove any residues. The sponges help to work the product in to the skin more effectively and remove excess cleanser, without totally stripping the skin. When using richer balm cleansers, I find that the sponges don't always take off every scrap of product, so I sometimes follow up with a face cloth afterwards to ensure my skin is fully clean, if necessary. My favourite sponge has to be the red clay pore refiner, as it seems to be the most effective at leaving my skin smooth and glowing. I have noticed that both the green and grey sponges leave my skin feeling slightly tight and on the edge of uncomfortable after use, which would make sense as they're catered more towards oily skin, whereas mine is dry/dehydrated. It may be total coincidence, but a couple of blemishes cropped up on my forehead and chin after using the Sloth sponge. Whether it was the charcoal-infused puff that caused a few spots I had lurking under the skin to rise to the surface, I don't know. But, they soon disappeared and my skin has been pretty clear since. My first introduction to konjac sponges has been amazing and now I've become hooked on using them. The only negative about this collection, is that the mini size means it takes longer for me to cleanse with them, than it does with other cleansing tools. It's not a major deal-breaker that would put me off using them, but it can be annoying when I'm tired and want to get my routine done quickly. I'm now eager to try the regular size and more of the Konjac Sponge Co's other interesting products, to see how I'd get on with those. 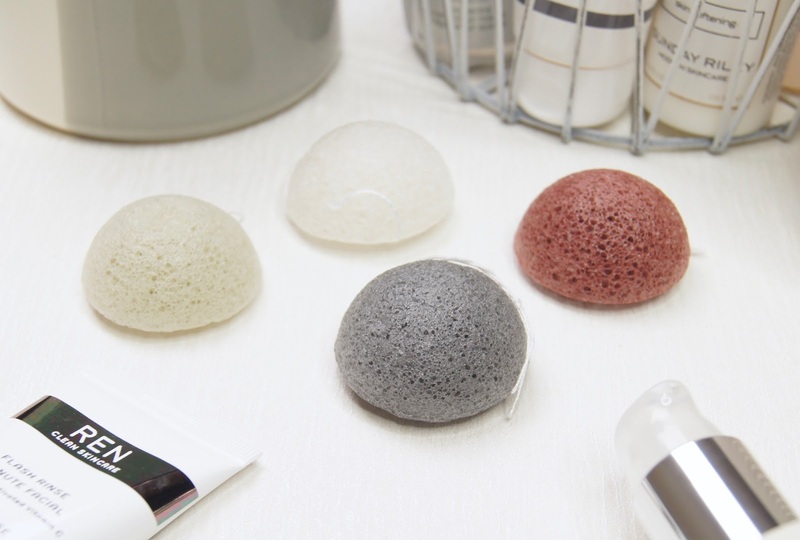 Have you ever tried cleansing with konjac sponges? I love the bamboo charcoal one!